As one of many home design companies presenting at the recent Hawaii Home Expo, the Japanese toilet manufacturer Inax found a way to stand out from the rest of the crowd. The Japanese are known for their high-tech commodes, but recently home remodeling trends have tipped in the favor of sustainable options, and Inax has been working to be at the forefront of this revolution. According to KHON2.com, Inax's new line of toilets is one of the most energy-efficient options available, and comes with a slew of potential features like deodorizers, sound systems and heated seats. In the past, toilets used between three and four gallons of water per flush, which could certainly add up after time. 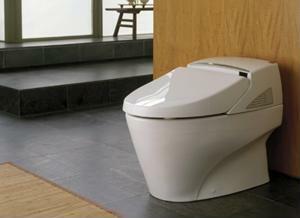 The new Inax commodes will use a combination of a vacuum effect while utilizing the smallest amount of water possible. "So if you take the amount of time that you do number one and you take the average of how many times you do number 2, put that together take an average, we have a flush now that averages less than one gallon per flush," industry insider Bruce Okimoto, told the news source. In addition to being good for the environment, Inax and many other toilet manufacturers are making a commitment to bathroom products that can resist the build-up of grime, bacteria and other materials. The company has added a glazing on the surface of the toilet itself that contains trace amounts of silver oxide, which makes it far easier to clean and can last far longer than its predecessors. Low-flow toilets like Inax's new design are part of a new wave of bathroom technology that embraces efficiency and sustainability in one package. When homeowners are looking for one of these thrones of their own, TLC.com recommends looking for a "WaterSense" label from the Environmental Protection Agency (EPA). This will ensure that the toilet will use no more than 1.28 gallons per flush, but prospective buyers must also be sure that it can clear out waste effectively while reducing water usage. While these new designs may be a bit more pricey than their predecessors, the long-term cost savings will make them a worthy investment. It is the best choice for homeowners looking to limit their impact on the environment and give their washrooms a decorative twist.